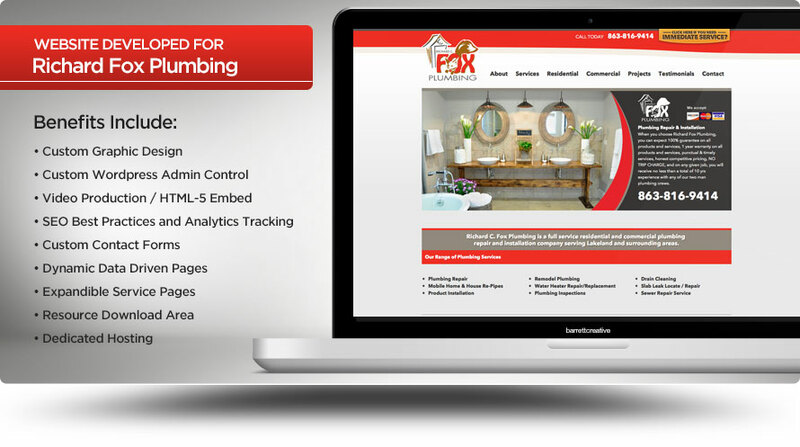 Richard C. Fox has been operating a successful plumbing company in Lakeland without a presence on the web, mainly because of his commitment to excellent customer service, affordable prices and an unmatched quality and knowledge. Richard approached Barrett Creative because he heard, from a previous client, of our ability to create handcrafted websites that generate leads, rank high in search engines and offer clients the ability to easily control and manage their content. By gaining knowledge through working with other service companies, we focused on the Call to Action, since that’s what most people are looking to do when searching for a plumber. That means when someone needs immediate service or is interested in hiring Richard Fox Plumbing, they don’t have to scroll, click a bunch of links or jump through hoops to contact Richard quickly and easily. We also created beautifully designed service pages to clearly describe the wide range of services and unique offerings. In the background, we created an incredibly easy-to-use content management system where Richard’s team can effortlessly add, update or edit any content as their business continues to grow. We also created a “Latest Projects” section where Richard can highlight some of the larger projects they complete and visually show their customers the variety of plumbing problems they are equipped to solve. On the search engine front, like every site we develop, we created the site with Google SEO best practices. We understand the value of ranking for search engines but we know that people are the ultimate customer and if the site’s not designed to provide them with the best information and solution available, high rankings don’t mean a thing. Finally, we added our special touch to the URL structure, title tags and header content and a few other elements to make the site easy to index. As a client with a previously empty web presence and a new domain name, the site has gradually moved up through the search engine rankings and has began to generate the leads initially desired.